Reports in France are linking Newcastle with a move for Loreint left-back, Raphael Guerreiro. 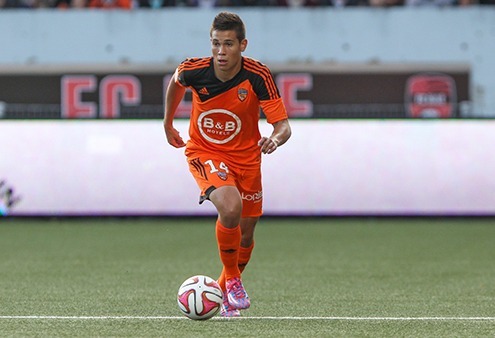 He has been valued at €12.5m (£8.8m) by Lorient president Loic Fery, and the club are supposedly listening to offers. Newcastle would face stiff competition for the Portuguese international, however, with Paris Saint-Germain and Athletico Madrid also in the running for the left-footed defender. While diminutive in size — 5’7″ and 138lbs— Guerreiro is a big talent, and may well follow the path of former Lorient star, Laurent Koscielny, who left the shores of France in 2010 to enjoy the splendours of the Premier League. Newcastle have been increasingly linked with moves for left defenders over the past few days. While we brought you the news that Jetro Willems was spotted in the stands on Sunday, we’ve also been linked with moves for Jose Enrique and MLS defender, Kemar Lawrence. We currently have two left-backs in our squad, Massadio Haidara and Paul Dummett. While the former started the match on Sunday, and received negative reviews following his performance, Dummett has been played more as a central defender recently. And it is highly plausible that he could be used there more regularly this season if Williamson were to leave. Would you like to see Guerreiro in a Toon shirt? Or should we be focusing our attentions elsewhere?